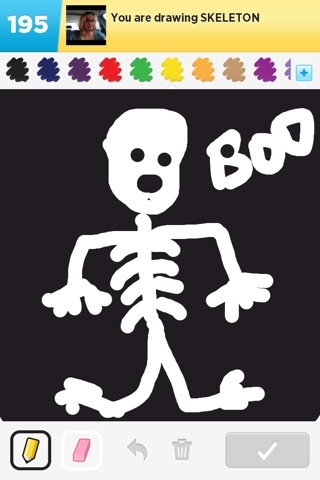 I love the app Draw Something. It's the main reason my mom gifted me an iPod touch with the capability to run the app. It's pictionary online, and you use your fingers to draw. There are 11 badges available for the free version of the app (there are likely more for the paid version). They're just collections of words that are around a theme. You can't see what the words are, but you can see the themes -- like "Don't Go In There" (skeleton is one of the words) and "Beauties and the Beast" (flower, princess, woman and kingkong) and "The Hardest Spelling Bee Ever" (3-letter words like tea, art, red) -- and see how many words are in each themed badge and how many letters each of those words have. As you draw a word that's in a badge it will show up within that badge as complete (as far as I can tell it doesn't even need to be guessed correctly -- you just have to draw it). Once you draw all the words within a badge theme you are awarded the badge and given a bonus of coins. As far as I can tell it's 10 coins per word in the badge (for the "Beauties and the Beast" badge I got 40 and for "The Hardest Spelling Bee Ever" badge I got 50). There doesn't seem to be anything else you can DO with a badge -- some of the questions I read online were "how do I open the badge?" and "what do I do with a badge?" Really I think they're just a way to keep people playing and a way to earn more coins quickly. The words for the badges do not have to be opened with a bomb. As I have completed the badges I have noticed that the badge words are marked in the lists with a little badge icon. If I see that icon, I know to pick that word to draw (even if it's an "easy" or one-coin word) to get closer to earning a badge. But some days I don't see a badge word at all, so I'm not sure how long it would take to complete all 11 badges -- or if there's a bigger coin bonus if you do. Hope this helps, and if it's unclear I can try to explain myself better. And if I figure out other things as I go along I'll update this post. I have never seen the badge icon in the list! I have 22 badges. I'm one away from 23, but haven't gotten any of the "Know Your Meme" words yet. Frustrating. Ah, so if you have the paid version you must have access to 23 badges. Also, Miley is one of the "know your meme" badges, and my sister has seen messages in the game saying "draw X to earn a badge," which is something I have never seen. Me to! I agree!! I completed all the other badges ages ago without problems except for the "Know You Meme" badges. It took a while but they all appeared to draw. Fo ages I've spent coins to use all the special words & still am yet to see one "Meme" word to draw! Hmmm! Could it be that they aren't released to keep us playing on?! If not then where are they?! I agree!! I completed all the other badges ages ago without problems except for the "Know You Meme" badges. It took a while but they all appeared to draw. Fo ages I've spent coins to use all the special words & still am yet to see one "Meme" word to draw! Hmmm! Could it be that they aren't released to keep us playing on?! If not then where are they?! I have completed all the badges, except for 'know your meme' as well. I have gotten 3/5 on it, I found the word 'wonka' in purple things, using one bomb to open. Then I found 'lolcats' and 'rickroll' using six bombs each to open interwebs. Just 2 more to go! What are other special words categories that contain badge words? I have been very dilligent looking for these words and they don't seem to cone up and then I may get two or three in one day. I have earned all of the Badges except Draw Some Meme. I found And drew Wonka a long time ago. I have been resistant to spend six bombs on any special word category, but I guess I'll have to try Interwebs as I'm about to give up ever finding LOLCATS, RICKROLL, ITSATRAP and BRONY. Dear anonymous, I tried anime, using 6 bombs. No meme badge words there, either. What a waste of my hard earned bombs. I've earned a few badges in the past, but since a few months ago, the whole badges-thing totally disappeared from the (free) game. What happened to them, how can I get them back?